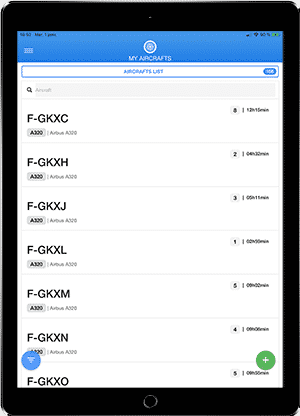 An app made by pilots, for pilots. AUTO SYNC flight times ! Display extended stats : RWY used, distance travelled, fuel/pax, delays. Visualize your alertness according an elaborated bio-mathematical model. Monitor your GPS taxi position on airport AMM ! 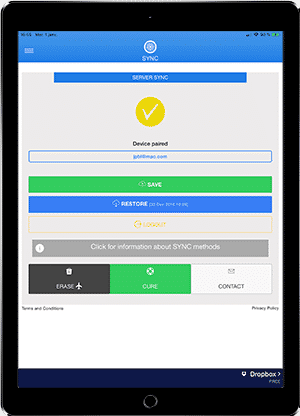 Sync your devices via our server or your own Dropbox. All Free ! 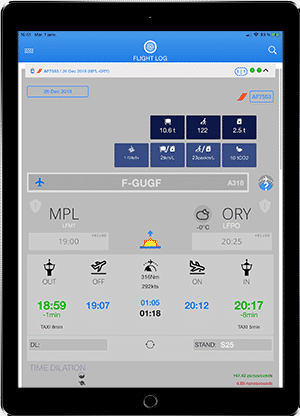 This logbook app is made by pilots for pilots, certifying the relevance of functionalities. Access your logbook even offline. Create a flight manually, one by one. Or better is to import your schedule via your preferred roster. Some airlines are already compatible (AF, Iberia, ANZ), or you can use RosterBuster. If you want your import your airline, contact us. All your flights at a glance. Your airline logo is automatically displayed according to your flight number. Log all data you want : TIME | PAYLOAD | PAX | FUEL USED | PARKING STAND | DELAY | FUNCTION ON BOARD | ACFT REG | RWY IN USE etc… and log your personal notes, even special threat note per airport. Get the weather expected on destination in 1 click, useful for CPT annoucement. 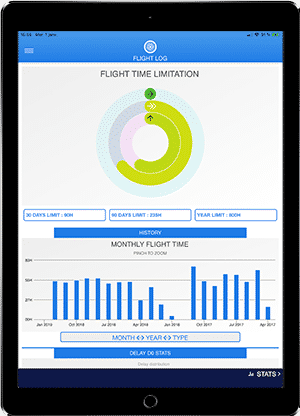 Display the on-time performance stats for your specific flight number and compare to your own ! Calculate the sunrise time will occur along your trip, and spot on map. Same for sunset and moon events. With GPS, or (better), with a waypoint report. For the first time on a free app, you can also check your location on airport moving map (AMM) ! Activate your GPS and you’ll see your aircraft on taxiway. Zoom in and display stand numbers. 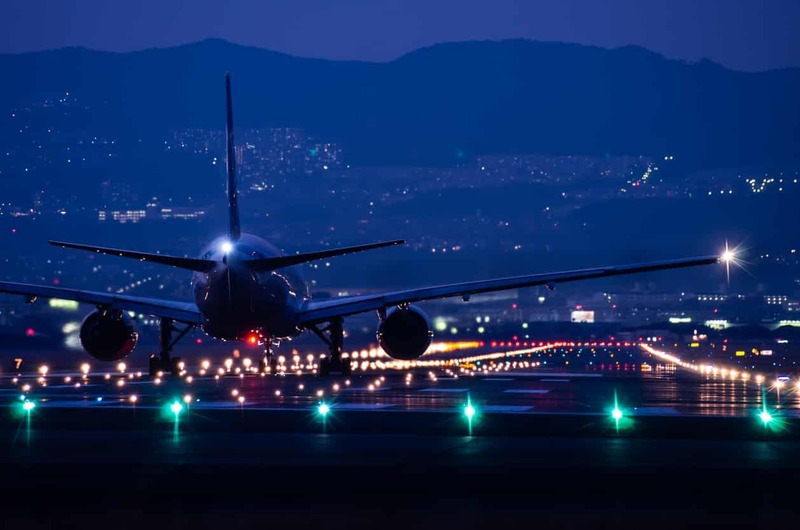 (Contact us if you need an airport). 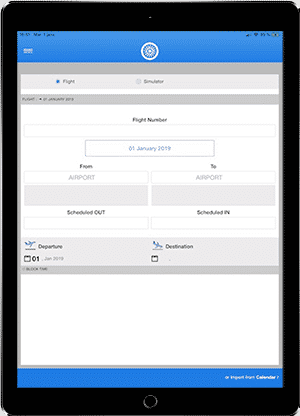 As for Flights, with this logbook you can manage your aircrafts, with tail number and aircraft type, and display some stats. Of course you can create your own type if you fly private aircrafts. All your aircrafts sorted by flight time / registration mark / # of flights. You can edit them by sliding to the left. Create a free account on our server to SAVE and RESTORE your logbook, or use your own Dropbox account to do so. Have you ever wondered how many times you travelled from Earth to Moon ? Or how light-minutes you flew ? Check your 30days / 90days / year limitations. You can also visualize your flight time by month / year / aircraft type. Visualize your delay on departure/arrival. Settings : activate some options like night flight time, extended stats and Time Dilation. Display your stats as RWY IN USE for take off and landing, for each airport. 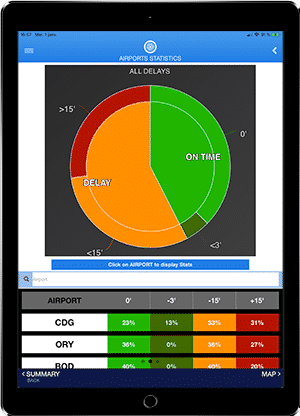 Display your stats as DELAYS globally, and by airport. Display your stats as PARKING STAND for each airport. Don’t wonder anymore where you were parked last time ! 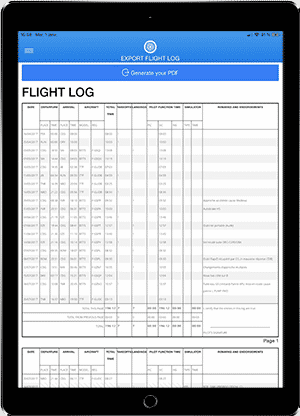 Export and print your Logbook in EASA format (Jeppesen) automatically signed. 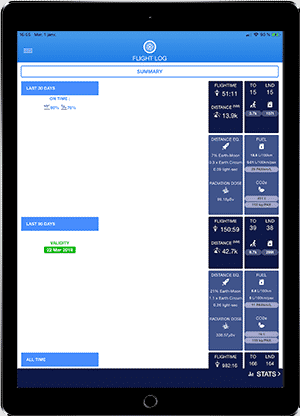 For the first time in any Logbook app, a tool designated to visualize your alertness. 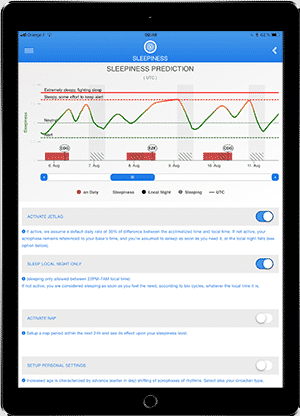 Import your roster and see your predicted fatigue according to jetlag and sleep deficit. This uses a predictive Bio-Mathematical model. Setup your personal settings, activate jetlag or not, and check the better time to organize your in flight rest. 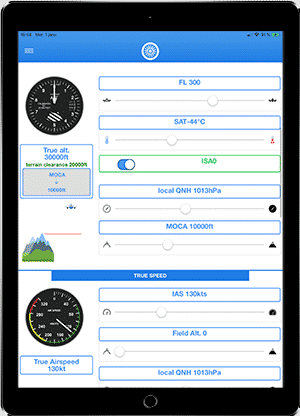 Several tools like a relief margin calculator in true atmosphere, true speed calculator, METAR decoder, units converter. The app includes a weather radar map, and a prediction tool of auroras. 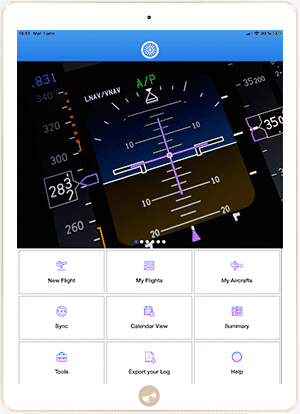 A great app to keep your flight log and limitations, and all for free! The developer is very responsive and improves the app regularly. C’est facile, c’est joli, c’est pratique, et c’est gratuit! Merci au développeur. C’est du super boulot, et enfin un moyen de suivre son expérience récente pour les Bi-qualifiés. J’adore le calcul du vieillissement temporel relatif! Tout simplement parfait! Application très complète. Simple à utiliser. Une fois prise en main impossible de s’en passer. Gratuit, aucune pub, et pas de bugs. Je recommande. Hello, thanks for the lovely app! The design is easy and understandable! Appli très complète, avec un développeur aux petits soins en cas de remarque, de demande de fonctionnalité, ou de proposition.